Now, as much as I love cemeteries, I don't have a large library on the subject. 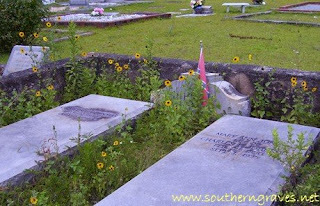 I do have a few books, though, dealing with symbolism and southern cemetery symbolism. In only one book, Douglas Keister's Stories in Stone: A Field Guide to Cemetery Symbolism and Iconography, did I find mention of sunflowers in cemeteries. He was referring to a sunflower carved into a gravestone. They signify devotion to the Catholic Church. This would seem to strike down the theory of symbolism in this case. 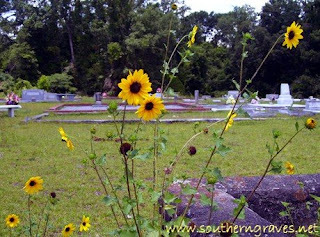 Sardis Cemetery is attached to a Primitive Baptist Church. I did go looking online as well, and come across "Gravestone Symbolism" at Grave Addiction. The meaning there was given as devotion to God. OK. So symbolism might be back in play. Keep in mind, these meanings were referring to sunflowers carved on gravestones. 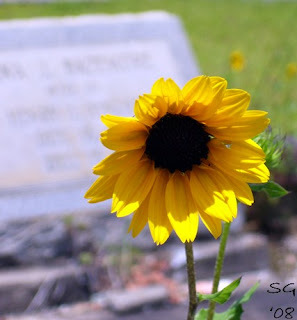 I found no mention of sunflowers when looking for information about cemetery landscaping and symbolism there. I guess, in the end, I can't say for sure. It might just be the planter liked sunflowers and thought they would beautify the plot. Or, maybe Mr. and Mrs. Johnson were fond of sunflowers. Here lies the problem of symbol interpretation. Just as with a work of literature, we must understand the point of view of the reader as well as of the author. Cemeteries exist in societies. When we walk in them, we are walking amongst members of our own community. What it all means depends as much on us as on what the stonecutter or the patron wanted to convey. Maybe the fondness for sunflowers is more about me than about the Johnsons.